The Goddess goes by many names in the Hindu tradition. She is Parvati, the wife of Shiva. She is Lakshmi or Bhu Devi, the wife of Vishnu. In some cases, her role as a “wife” fades almost completely, and she stands on her own as Durga or as Kali, her many arms and many hands filled with the weapons of all the male gods. She is omnipotent, to be sure. Among her names is Shakti, which means sheer energy or power. Her most common name, however, for those who come to her in prayer is simply Ma, or Mother. There are also particular women who are said to embody the presence and power of the Divine and are, therefore, referred to as “Ma,” by their followers. In any Vedanta Society temple, for example, one will see the image of Sarada Devi, the wife of the saint Ramakrishna, who was held to be the embodiment of the Goddess. In modern times, there are many “Ma”s who attract followers around the world and in America. 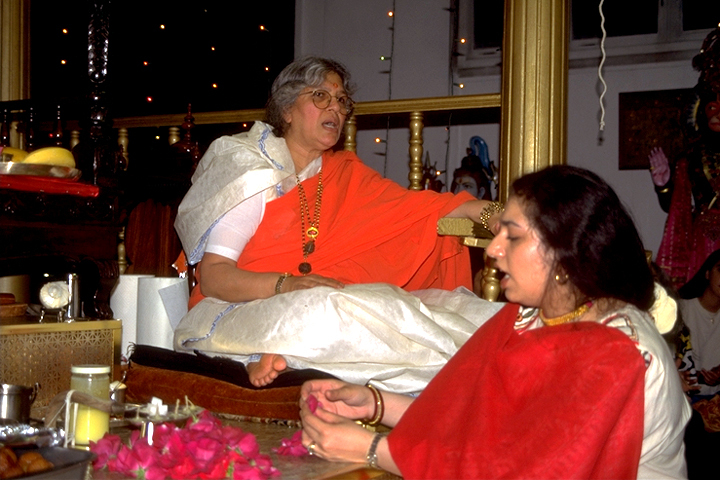 In Hempstead, Long Island, Guru Maa, is a teacher and religious leader who is accorded the respect and love of the Divine Mother by the members of her community, who seek her out for both her advice and her blessings. 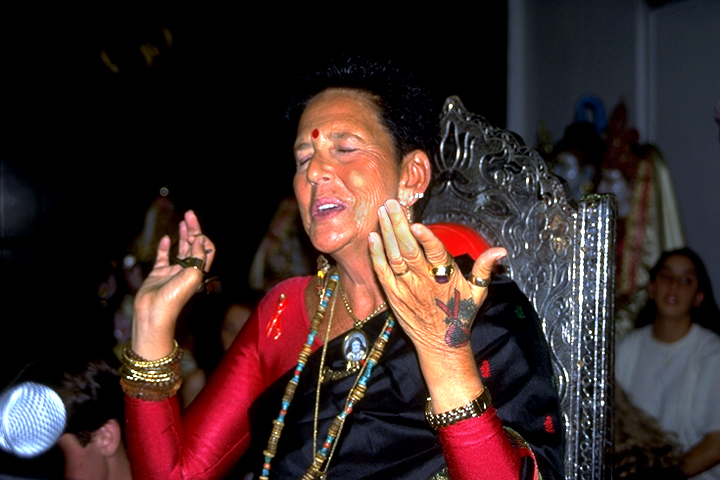 The same is true of Ma Jaya Sati Bhagavati of the Kashi Ashram community in Florida, who is loved by her followers as an embodiment of the Divine Mother. Both Ma Jaya and Guru Maa perform puja to the Gods, especially to Hanuman, Shiva, and Devi. For their congregations, however, both women evoke the powerful presence of the Divine Mother and are honored as such.